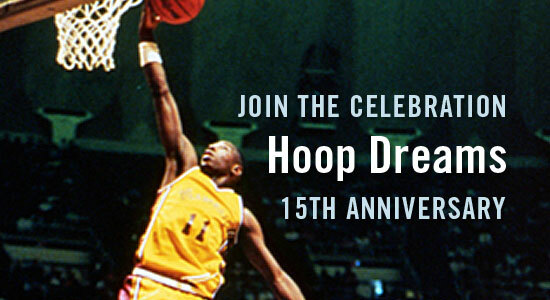 Celebrate with us: Hoop Dreams 15th Anniversary! This fall marks the 15th anniversary of the 'best documentary of all time' and Kartemquin is celebrating the birthday of our beloved film Hoop Dreams by throwing an unmissable party on November 4th at the Gene Siskel Film Center. The event will be a celebration of the groundbreaking documentary, and will feature opportunities to interact with the filmmakers and subjects, as well as prestigious guests and speakers who will discuss the film's legacy and impact. There will also be exclusive sneak previews of Kartemquin's upcoming films, and the launch of the new Kartemquin Development Fund, enabling us to support the next generation of life-changing documentary films. Please join us! Tickets are now available via www.kartemquin.com/films/hoop-dreams/15 or by contacting Development@kartemquin.com.